This book. I can’t even find the words to express just how amazing the first book to this series is. I’ll be honest, I downloaded the audiobook because I was intrigued with the TV show, but I did listen to half of the book before starting the show. Outlander follows Claire Randall, who’s reunited with her husband Frank after her role as a war nurse in WWII. They head to the Scottish Highlands for their second honeymoon, but she soon finds herself transported back to 1743 through a circle of stones. It’s impossible, you say, but it works. Claire finds herself in the middle of a war between the Jacobites and the English Red Coats, and to her surprise, the captain looks exactly like her husband and turns out to be one of his great relatives. And to her utter horror, Captain Jack Randal is an utterly despicable man. There was more than once when I just wanted to punch his face because he’s truly disgusting and horrible. Claire couldn’t even fathom how her lovely husband managed to have such an awful relative. Having escaped from Jack, Claire runs into a group of Scottish men, one of which is the ever handsome and valiant Jamie Fraser. I don’t know how many of you have seen the Starz adaptation of Outlander, but let me tell you — book Jamie and TV Jamie are both equally amazing. *fans self* Jamie is the true gentleman — brave, kind, and so selfless. He has a troubled past, is running from the Red Coats, but still manages to woo the pants off of Claire. She tries to keep her feelings from Jamie from developing at first, but not knowing whether she’d ever find her way back to her husband Frank, Claire soon gives in to her emotions and opens her heart to Jamie. Their relationship is beautiful and heartbreaking because of course, it’s not smooth sailing. But that’s what makes it truly epic. The romance is not the main proponent of the book, but it does play a large role in the story. A huge role actually, but you know what? It works because it’s a driver of a plot that’s riddled with different subplots all equally as interesting. It takes a master storyteller to be able to truly transport a reader to a setting as unique as 1743 Scotland. I have no prior knowledge of this era or its history, so was glad that such information was not dumped on me, but rather told through rich storytelling and amazing world-building. 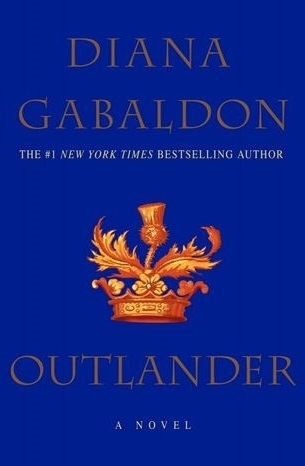 Gabaldon has created a world that immerses you fully — whether you put the book down for a second, or weeks on end, it’s easy to jump straight back in and feel like you’ve never left at all. Outlander is such a well-written book. It’s not surprising at all that it has such a huge fanbase — and I can happily say that I have now joined its bandwagon. You never really know where the story is taking you, or whether your favourite characters will be okay either. But that’s what makes this book so great — its non-predictability. I highly, HIGHLY recommend this to everyone and their dog (but please be aware that there are some scenes which may be hard to stomach).